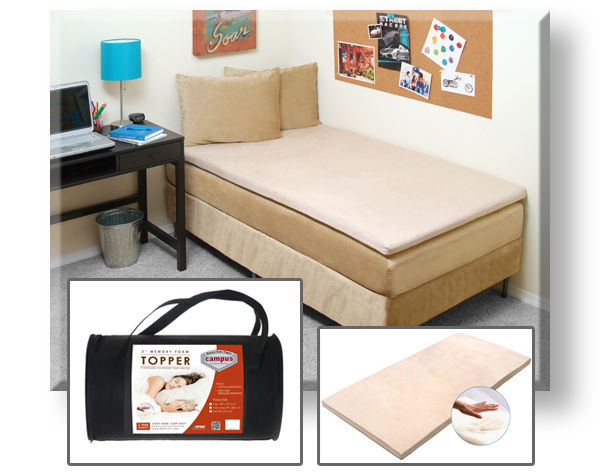 Designed to top dorm mattresses, the Campus memory foam topper works with any XL-Twin size (39x80 inch) mattress. The Campus Topper is constructed with 100% pure visco memory foam, providing body sensitive support. It is temperature responsive for maximum relaxation and rest. � Available in Twin XL size only. � Perfect for dorm mattresses. � Comes with compact duffle bag with carrying strap for easy transportation. � 2 inch mattress topper. � Constructed with 100% pure visco memory foam. 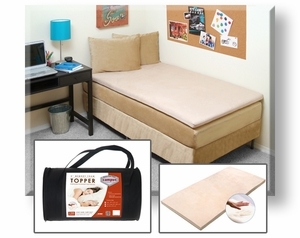 � Body sensitive support against rough, unstable dorm mattresses. We ship out your Mattress Topper via UPS Ground with tracking. Most orders ship out within 24-48 hours. The manufacturer warranties this product to be free from defects in materials and workmanship for a period of 30 days. Money back on returns notified within 7 days of delivery receipt. Buyer pays all shipping costs. Item(s) must be in unused and returned in original packaging. Return authorization required. Subject to $15 restocking fee.